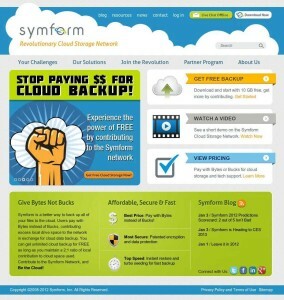 Symform gives cloud storage an innovative twist by using distributed storage model at its core. Instead of relying on one or two data centers, it will use other Symform-connected computers and contributed storage for your data backup. And you can pay for storage using your hard drive space too. If that tempts you, read on to find out more about how Symform works and if it will be of good fit for you. Or you can go ahead and signup now. When all cloud-based storage and backup service providers are using either Amazon S3 or their own proprietary infrastructure, Symform’s approach is very disruptively innovative and intriguing. Instead of relying on data storage at data centers, Symform leverages a form of P2P, or what we can call as distributive computing principles. If you are wondering what the heck it means, let us explain. Basically, at Symform you donate a portion of unused space on your local hard drive (either internal or external) to Symform network so that other users can store their data on it. In return, you get 50% of what you donate. If you still can’t do the math, it means you will get 50GB of cloud storage space when you contribute 100GB to Symform. And that’s on top of 10GB free space you will be getting for signing up. At this point, security alarm bells might be ringing so loudly in your head. Storing your data on somebody else’s hard drive? For god’s sake, how can that be secure! We have exactly the same thought so we dig deeper. Actually we didn’t have to dig so deep since Symform is pretty open about their security practices and technology. In short, what Symform does is that after encrypting your files, they will break down each file into small data blocks, and shred those blocks into 64 encrypted fragments, and send those fragments from each data blocks to 96 different devices in the Symform network. According to experts’ calculations, each block of a file is protected of up to 33 unrelated, geographically separate disks. Even if there is a zombie apocalypse in United States, it seems like your data blocks stored in other continents will be safe! With encryption and such level of fragments, there is no way each computer that your data blocks are stored on can access your data. The index and encryption key of your data only reside at your computer. Many of us have a lot of unused space on our computers. And storing fragments of our data on 96 geographically redundant devices seems to be a better idea for data redundancy than relying on 3 or 4 data centers. So we take Symform for a wild ride and test them throughout the week. Take a look after the break for our comprehensive review. Pricing plans at Symform are pretty interesting. At registration, Symform will offer you 10GB of storage for free. 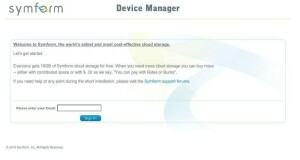 Additional storage can be purchased by paying either Bytes or Bucks. Confused? Bucks is exactly what you are thinking. 1GB of additional storage will cost $0.15 per month. This is pretty much in line with other “pay what you use” providers like JungleDisk, which charge similar prices. But what’s interesting is paying by Bytes. 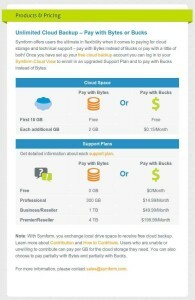 The ratio is 2:1, so every 2GB you contribute to Symform network will get you 1GB of cloud storage for your own data. Then there is another thing with customer support. There are four levels of support plans: Free, Professional, Business and Premier. Free support plan will only give you customer support through support forums and general webinars. Professional will also give you email support and telephone support within business hours (PST). Business support plan will give you all of that, a dedicated account manager, and 1x 1:1 training per year. Go with Premier plan, you get all of that plus 24/7 telephone support, 4 training sessions a year, and 2 hours guaranteed support SLA. Now you must be thinking that it will cost a pretty penny to get those support plans. You are partially right. But as with storage, if you choose to pay with Bytes, you can get those support plans too. Check out below. Now if you want Business level support, all you have to do is contribute 1TB of storage (pretty cheap with today’s hard drive prices), then you will also get 500GB of cloud storage as well as Business support plan. Even at 4TB, you are getting back 2TB of storage. We would say it’s very interesting deal. Symform also differentiates itself significantly from others with its unique features. Most of those features are “behind the scene” sorts and we feel that they are actually game changers. Folder synchronization. Essentially, Symform is a folder-level synchronization service. You can’t sync files but can choose which folders you want to backup to Symform, as well as add a folder already on Symform network to another computer. After initial syncing is done, any changes to your data will be synced incrementally. Cloud Control. Cloud Control is the name of Symform’s client application. Actually, as the name aptly implies, the majority of work it does is from Symform’s network side, leaving very little footprint on your computer once installed. Our tests showed that it uses system resources slightly heavier than JungleDisk, but only by 1.2%. What Cloud Control really does is more than just naming your device and configuring which folders you want to sync. It will also show you real-time reports of your data transfers and such, and other devices you own that use Symform. Dynamic Self-healing. 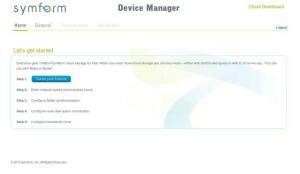 Symform’s Cloud Control will constantly monitor all devices that have fragments of your data blocks, and whenever a device is down or data is at risk of failure, it will quickly and automatically regenerates the at risk fragment and distributes to another device in Symform network. Hence, there will always be 96 fragments of each data blocks of your files in Symform network, maintaining data integrity and redundancy at highest level. Hot Copy. Basically, Hot Copy feature allows you to make a complete remote, off-site copy of your Symform-hosted data to another Symform-connected device. Pretty much like a clone, and you can have a secondary location to have a whole copy of your Symform-hosted data so that when a disaster strikes and you want to do a quick restore, you don’t have to wait until all data are downloaded. RAID 96 Redundancy. If you are familiar with NAS or servers, then you are definitely familiar with RAID 5 or 6, which increase reliability and functions through redundancy. RAID 96 is exactly what it sounds like. As we explained earlier, each encrypted data block are divided into 96 redundant fragments, and during restoration 64 of those fragments are sufficient to form back a complete data block. Geographic Distribution. Aforementioned 96 redundant fragments will be distributed across 96 Symform-connected devices across the world, giving us maximum data redundancy. Turbo Seeding. This is a bit similar to sending hard drives to data center for initial backup purposes, but Symform does it very differently. Instead of sending your data in hard drive directly to Symform, you just have to use Cloud Control client app and export all your data you want to do Turbo Seeding through an easy to use wizard onto an external drive you own. What will happen is that your data will be encrypted and shredded as if it were being sent to Symform cloud network, then copied onto your external hard drive. After that, you can take the drive to another Symform-connected computer you are using for contribution to Symform network and import the data. 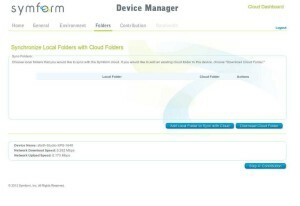 During the process, Symform Cloud Control will recognize the data fragments and will tell the original device to skip uploading of the Turbo Seeded data. Then overtime, the secondary Symform-connected computer you used for Turbo Seeding will distribute the data onto Symform network. Parallel Connections. Unlike using other cloud backup service providers, with Symform, there is no one pipe for data upload and download. Symform actually creates hundreds of parallel connections towards other Symform-connected devices, so data throughput is really fast. You can definitely throttle your bandwidth in Cloud Control configuration panel, and our tests showed that restorations or uploading data are incredibly fast. Cross-platform Compatibility. Symform will work with Mac, Linux and Windows OS. There is no mobile application available though. Security is perhaps one of the most interesting aspect of Symform, but we will spare you from all the details and only tell you what most users need to know. Symform will encrypt your data with 256-bit AES encryption before data even leaves your device. This is pretty high grade encryption. But what’s more interesting is how Symform breaks down the data and distribute them across Symform network. For a bit more technical details than what we have already mentioned here before, data in your folders are broken down into 64 megabyte blocks, then each block is shredded into 64 fragments (wait if you get confused with formerly mentioned 96 fragments), then 32 parity fragments are added for redundancy. All of those just fortify data security, since there is no way for a third party to access your data since those fragments are scattered across the world. If you are interested in more details of how Symform’s security and its technology works, head over here and read more. We couldn’t test Professional or higher tiered level of customer service plans. Instead, we could only test their customer support forum. They are pretty responsive, and you get the benefit of other Symform’s partners and users chiming in for advice. A search on the web reveals that they are pretty good with telephone support as well. And it seems that they maintain their support SLA very well. The process is actually quite easy. You just have to download the software through its home page, and install it. Thank god they offer 64-bit Linux packages! Installation is a breeze, and after that, launching the client software will open a new tab in your browser. Symform Cloud Control is running from localhost. You will then have to register your account. After that, you will see five step wizard that will guide you through the whole process. First step is to name your computer, and choose if you just want to backup your files or also want to contribute your space. Then you can configure bandwidth throttling, your business hours and such so that Symform will not use too much bandwidth during your working hours. After that, you get to add folders into Symform network. If you are on another device, you can add folders from cloud onto that computer too. Basically, Symform lets you sync any folders you want. After that, in next page, you will be prompted with how many percentage of bandwidth you want to use during working hours. Then, if you chose to contribute bandwidth, you will be asked to choose folder location for storage contribution. During our tests, we uploaded a few GBs of images and music. Initial seeding period is about the same as Dropbox and SugarSync. Then we also uploaded a multi-GB Lightroom database file onto Symform and leave it at that for a week, letting it complete the whole syncing. It was pretty huge file and it took over 3 days. We then uninstalled Symform and went on with our lives for about a month. Just two days ago, we reinstalled Symform and tried to download the Lightroom database file. Alas, the file is still intact and downloading was much faster than uploading, using maximum available speed of our ADSL connection! Pretty impressive. Symform’s approach to data storage is definitely interesting. We quickly found out that our initial concerns with data security are rather baseless, since Symform will not store any complete data on an individual node. And with “self healing” technology, even when some devices that your data fragments are stored upon go down, your data will always be redistributed back onto other devices, ensuring that your data is safe and always available. One thing we really like about Symform is that after we configure bandwidth throttling, we don’t really have to do anything nor its processes seem to have any significant impact on our connection. And synced folders remain synced in same structure, and restoration is pretty darn fast too. And the part we like most about Symform is that you can mix and mash paying by Bytes and Bucks to offset your storage cost, while ensuring you have what you need. So if you are looking for cost efficient, secured and super redundant storage solution for your cloud storage needs, and have a few unused disk space to share, Symform is a great solution. So stop seeding some of your torrents and start with Symform, will you? The index and encryption key of your data only reside at your computer. As far as I know unfortunately it is not true! I believe that it is the biggest security concerns of it. If it would be true, it was reproducing of data after total device failure impossible. Keys and and list in maintained by symform. So if so someone can access your index file + encryption keys can read your data. Moreover failure of Symform Cloud control would make your backup inaccessible. In that case, there is no difference between majority of standard cloud. Despite I think that it is useful. You need to pre-encrypt your data.